Is your commercial boiler system making noises or leaking? Is it inefficient or old and need regular maintenance, repair or replacing? Does your industry require a redundant system for seamless 100% uptime? We often think of boiler systems as old technology, however new advancements applied to preexisting technology has immense efficiency. 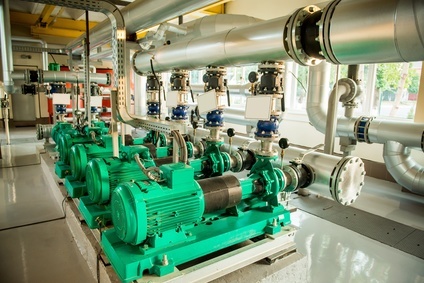 Warehouses, commercial buildings, retail and grocery stores, factories, hospitals and medical buildings, universities and education centers and schools; whether they be gas fired, oil or even electrical typically use a boiler system of some variety. A licensed gas 1 fitter is required to work on such large commercial gas steam boilers in Ontario. Modern central heating systems usually require a pump, this may seem to require more energy however in the long run it is far more efficient. Water chemistry is also of extreme importance in a steam boiler and must meet industry standard regulations. Industrial and Commercial boiler systems are more conducive to larger spaces as they work more efficiently than other heating systems in this setting. They are also used for multi-residential complexes and apartments for the same reason. Condensing boiler systems are far more efficient than combustion – by upto 90% by utilizing a heat exchanger. Commercial condensing boilers do produce moisture, but this can be remedied by a small drain pipe. If the drain pipe freezes, the boiler could shut down, and a licensed technician would need to repair and restart. In some systems, the boiler can be swapped out using existing infrastructure, other times it requires retrofitting or replacing and reinstalling. A good licensed technician will offer you the best value for the property or provide multiple options from which you can choose, depending on what is most important to you. If installation cost is more of a factor than running cost, or greatest efficiency overall long term or a fix that brings it up to code and keeps the existing system going, if possible. Some industries such as health care and processing applications are required to have redundant systems, such that if one fails, the other kicks in seamlessly. Modular boilers could be an ideal solution for this, and has a smaller footprint. Residential radiators and boilers are less common but still in use. Some older systems, especially residential relied on the heat alone to rise naturally – gravity fed – through the radiator system which is notable by the tank of cold water on the uppermost level of a house or attic. Although it omitted the pump it was far less efficient especially getting heat to the top floors, and not in any speedy manor. Semi-pump systems use a combination of gravity and electric pumping. Do you have multiple workplace facilities, franchises, homes, offices or retail space? Heating Ontario is fully licensed (including G1) and offers fast efficient appointments. We are a Canadian Company! For an instant free estimate, call us at 647-591-2683 or see our locations on our contact us page.